Hello everyone! It’s been a while, hasn’t it? The potent combination of work, a steady relationship and various other hobbies have kept me way from the game for almost a year now, a few stray drafts notwithstanding. In fact, I’ve played so little competitive Magic lately, I’m not even qualified for Nationals (yet – I’ll have you know I have my sights set on those last chance qualifiers and you’d better not get in my way! ), and my teammate Sander (DC, not to be confused with Sander DG or the aptly named, Sander DQ, he of judging fame) now seems to have the semblance of a beard. It doesn’t yet rival Bob “The Bearded One” Jacobs’ luxurious specimen, but still. First the lenses, now the beard. By next year, I’m guessing Sander will be wearing hipster clothes and chopping wood. Anyway, back to the story. During summer, my schedule tends to clear up a little bit, so I’ve been trying to get my collection back up to speed in order to make my glorious return to the Gentry scene. The Gentry side event at GP Brussels, the main event of which I had to skip anyway due to Lack of Deck™, seemed like the perfect time. Thanks to Niels Viaene, I managed to scrap together enough cards to build what resembled an actual Gentry deck. I was positively stunned by the lack of Hidden Stockpile decks at the last Gentry Open and Invitational, so I came out determined to teach these kids some respect. Niels went out of his way to find me the Renegade Ralliers and Stockpiles to build the list above, so obviously, I wound up registering something else entirely. Sorry Niels. It won’t happen again. (Who am I kidding. It probably will. Apologies beforehand.) Having proxied the deck, I put some time in goldfishing it, to get a feel of how it ran, something I tend to do with all of the decks I brew. I didn’t like the outcome. While it ran very smoothly at times, there were obvious indicators that it needed further tuning. Too few creatures for the Benefactions (which were amazing sometimes, drawing two cards and putting an embalm creature in the yard; but equally often, they were duds), and without knowing the metagame at least a little, I had no idea what answers to invest in. All in all, the deck didn’t feel right, so the morning of the tournament, I decided to brew up something else entirely. The deck combines a number of ideas. I liked the explosiveness of the Goblin GPG decks, which allow you to go off much more quickly thanks to the sacrifice outlet and mana production of Skirk Prospector, but I didn’t like the beatdown angle those decks tend to take, so I only held on to the Prospector package. Instead, I decided to dip into blue and white for a number of my favorite value creatures. 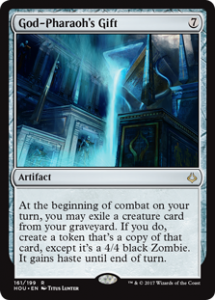 This way, the deck actually gets to play a pretty good fair game with Whirler Virtuosos and Cloudblazers, allowing you to go toe to toe with a lot of the value decks until you find your Gate to the Afterlife. Finally, the deck features several pretty neat “finishers”: Combat Celebrant and Lightning Runner (and Mirror Image copying them) allow you to take multiple combat steps, triggering your God-Pharaoh’s Gifts multiple times within one turn, which is usually game over. In testing, Prospector once allowed me to trigger Gate on turn 4, bringing back Combat Celebrant into Mirror Image into Cloudblazer, which is just all kinds of nasty. The card velocity of the Gates alongside the Carthartic Reunions also allows you to find your one- and two-ofs much more regularly than you would usually expect, which is another upside to the deck. All in all, I enjoyed this build way more, and after goldfishing some more, buying the cards I didn’t have at the overpriced GP vendors and writing a decklist I didn’t turn out to need, I found myself playing Jeskai GPG at the event. I won the die roll and opted to play first, hoping for an explosive opening hand. Instead, I drew a bunch of creatures but no engine cards, and one too many lands while chipping away with a lonely Thopter token. Once Joeri played a Bitterbow Sharpshooters, even that fun was over, and I soon succumbed to his train of value creatures. Lesson 1: when you don’t draw your Cathartic Reunions and Gates, this deck is prone to fizzling out, as Skirk Prospector and his Goblin friends really aren’t that impressive when you are not going off. In Game 2 started off slow as we traded value creatures, but when I eventually managed to slip a Gate through his defenses, it made quick work of the game, as I managed to exert a zombified Combat Celebrant into a second attack step, retrieving Mirror Image copying the Celebrant. Yippikayee! Which I then of course promptly forgot to exert. Sigh. Luckily, it didn’t wind up costing me, as I won the game on the next turn. I had an awfully slow hand in Game 3, but because Joeri was stuck on three lands for a while, I managed to dig my way out of it, sneaking in a Gate when he tapped out to deal with some of my small creatures. Lacking green mana, he had to watch my GPG go off as he stared at the Naturalize in his hand. 2-1, and 1-0 in matches. Pieter was playing a pure UB variant of the midrange deck full of value creatures, presumably focusing more on consistency and counters than the Abzan, Esper or Sultai versions. Luckily for me, that meant he couldn’t have as many good answers to a resolved Gate to the Afterlife, so all I had to do was wait for a chance to sneak one in behind his counterspells. That plan worked in the first game, eventually setting up another Combat Celebrant into Mirror Image sequence that took Pieter by surprise. Afterwards, he confessed he could have played the turn before differently, which wouldn’t have allowed me to go off. In Game 3, I snuck in a Gate on the third turn. Two turns later, I could crack it for God-Pharaoh’s Gift with Negate back-up. Pieter had the Blink of an Eye ready, but couldn’t counter back, as he only had one blue mana. The GPG did its thing, and that was that. Kobe seemed very nervous, but was also a gracious opponent. Game 1 was a real corker, and took no less than forty minutes. I can’t spend too much time on the details, but in essence, I felt like I was losing badly throughout the first ten turns or so, as I got an early Gate Cast Out, and Kobe played Sky Scanners, Ravenous Chupachabras and The Eldest Reborns (grabbing a Trophy Mage from my graveyard to get another Sky Scanner from his deck – neat play! ), while I was stuck with creatures that couldn’t get past his Gifted Aetherborns. My horde died in a Golden Demise while Kobe chipped away with the two Aetherborns. At one point, I was at 4, while he was at 28. But then, finally, a second Gate showed up on the top of my deck, and it seemed like Kobe had only found lands in the meantime. Turn after turn, I recurred Whirler Virtuosos to trade with his Sky Scanners and Aetherborns, desperately trying to stay alive and hoping he didn’t draw the final haymaker. He didn’t, and it looked like I was going to win after all, the both of us drawing only lands but my GPG providing me with a hasty 4/4 every turn. What a crazy game! Then, just as I was about to put on the finishing touches, he topdecked the Scarab God, and with plenty of mana to work with, it looked like I was in a pickle once again. Remember, I was only at 4 life, and Scarab God effectively nullified my GPG. My turn to topdeck then, as I drew an Aven Windmage, which allowed for my zombified creatures to sail over The Scarab God and his possible minions. What a crazy game! In a final effort, Kobe returned a Sky Scanner with his Scarab God and found… a Deep Freeze which shut down my plan. The final nail in the coffin. With only minutes on the clock to try to finish a second game, I scooped. WHAT A GAME! Somewhere in between all this, Bob came over with a huge stack of booster packs, only to tell me that he would sit across from me at another table and rip open each and every one of them. For old times’ sake. The horror. (Kids, don’t just rip open your boosters, ok? Draft, play 4 pack sealed with a friend, play boosterwars, whatever, just don’t just rip them open. My poor heart can’t handle it.) I had a few choice words for Bob, and told him if I lost this match, it would be because of him. He proceeded to rip open the boosters. The Devil has a beard. I decided not to sideboard to keep things moving, and Kobe hurried up his sideboarding, which I greatly appreciated. He wanted to give me a fair shot at a second game. With seven minutes on the clock, we drew our opening hands. I had a great draw, and within minutes, I had GPG recurring not one, but two Cloudblazers, and in the second turn of time, Kobe scooped up his cards. A draw. 1-1, and 2-0-1 in matches. Because there was no difference in prices, I eventually decided to scoop the match to Kobe, so he could get the bye for the Open, which he obviously wanted, but was gracious enough not to ask for. I’ve played plenty of Opens by now, and it obviously meant a lot to him, so I was happy enough to give him the bye. We split the prize tix down the middle, and I came away with 20 boosters. Not bad for a three-round tournament! Practice your sequencing. GPG triggers during your combat step, so don’t forget to play anything relevant to combat before you allow it to trigger. I messed this up twice. Sequencing with Gate to the Afterlife and Skirk Prospector can be tricky as well. The value creatures (Virtuoso, Cloudblazer) were great all day. The Firebrands and the Instigators seem somewhat lackluster, though they sometimes combine with Prospector to power out a crazy fast Gate to the Afterlife into GPG. Aven Windguide was very good. This looks a like a very good fall-back plan. The Mirror Image was awesome, copying Celebrant, Cloudblazer and Whirler Virtuoso, depending on my need at the time. I would love to find room for another one, but since you mostly want to copy the other uncommons, it’s hard to cut something. The same problem applies to Trophy Mage. Cathartic Reunion was an all-star, and probably the best reason to choose a red version of GPG over other colour combinations (which may very well be better overall). The “combo”-finish is nothing to sneeze at, but Lightning Runner seemed underpowered. In the future, I might look to replace it with something like Vizier of the Many Faces. For those of you looking to win in the current metagame, which is seemingly infested with value midrange decks, I think it would be wiser to move away from the more explosive elements of this version towards an even more value-oriented approach. I’ll be looking to try out all kinds of new decks before the Gentry Open coming up in early September, so perhaps I’ll see you across the table one of these days. I’m enjoying my return to Magic, and I hope you’ve enjoyed my return to writing tournament reports. Tom Vandevelde has been playing Magic since Tempest, and competitively since Time Spiral. Deckbuilding is his favorite part of the game, which has led to him taking an interest in less conventional formats like League Standard. Alongside his teammates on Team Wrecking Ball he is shooting for the Pro Tour, but you will just as often find him playing Pauper, Pack Wars or Mental Magic, or helping out newer players. You will often find Tom streaming on twitch.tv/wreckingballmtg, where you can actually challenge him to League Standard matches in between rounds! Be sure to come hang out and don’t be afraid to ask questions!